So that's the motivation behind this blog post. Within the 7.2 release notes, there's actually a specific list that maps old menu item locations to new ones, but I thought that a little visual representation might help. This post will help you navigate from GSA 7.0 to GSA 7.2. Basically, the new admin console has mostly the same functionality as the old one. There are a few completely new menu items, but pretty much everything in the old menu is also in the new one. So, this is largely a matter of mapping specific menu items into new menu categories in the new admin console. 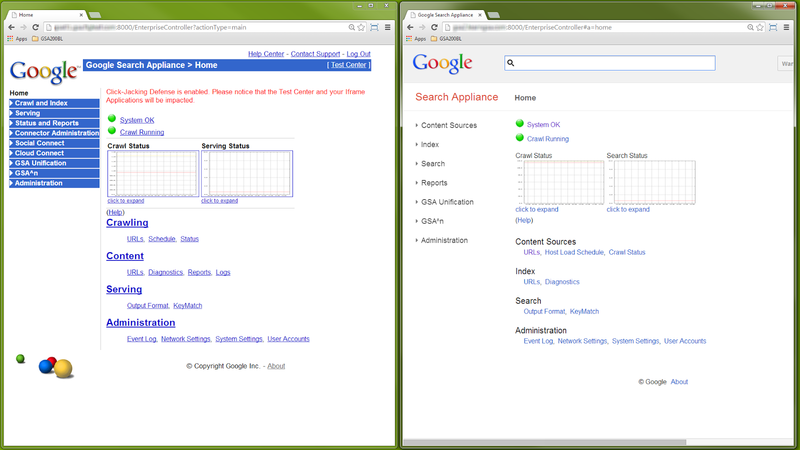 GSA Admin Console home screens - 7.0 on the left, 7.2 on the right. With a little bit of explanation, I think it's pretty easy to understand the new organization. 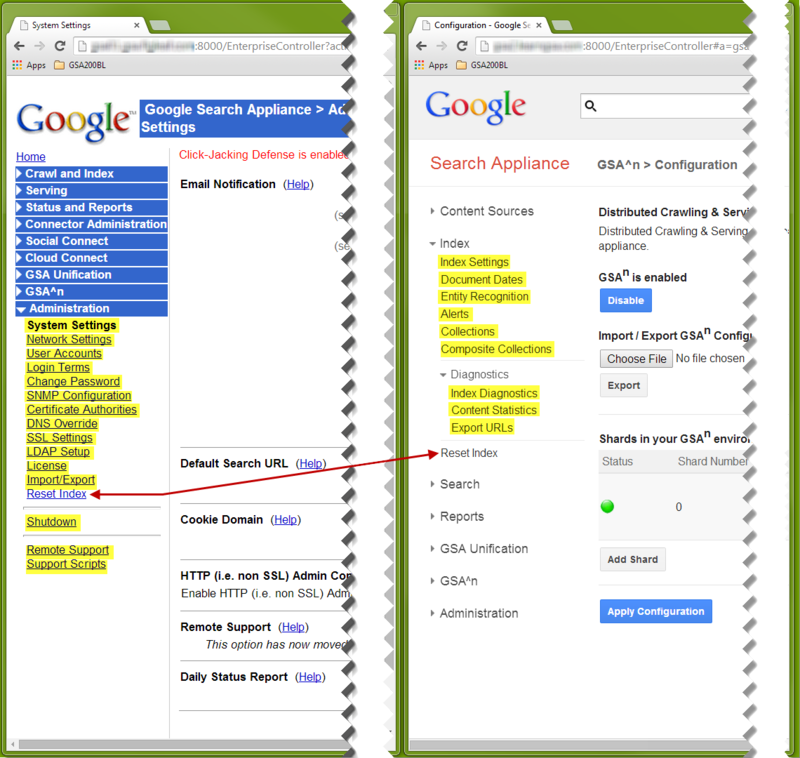 On GSA 7.0, we have Crawl and Index, Serving, and Status and Reports. 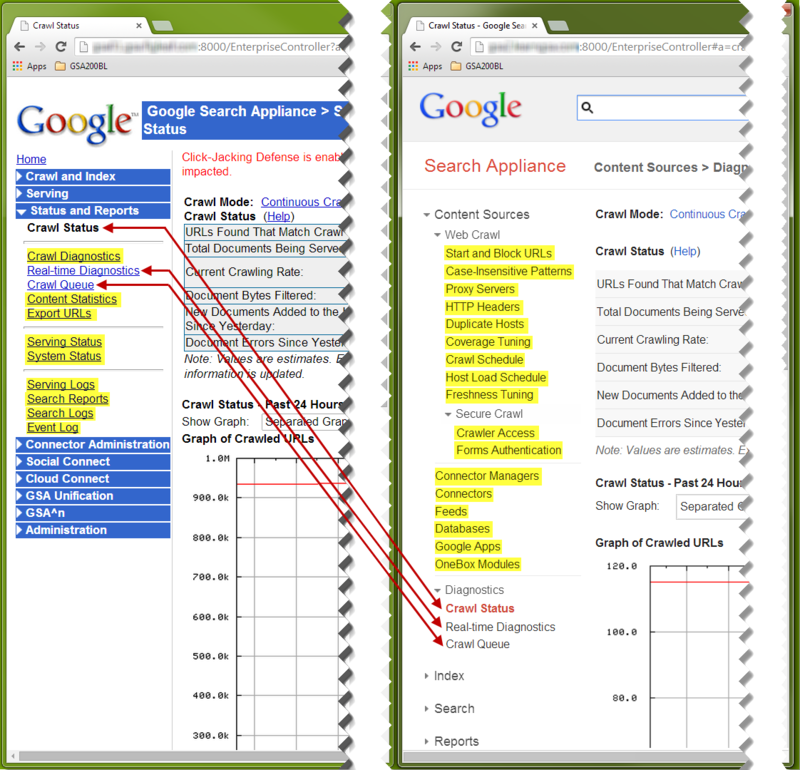 Crawl and Index covers any setting that controls the acquisition and storage of content. 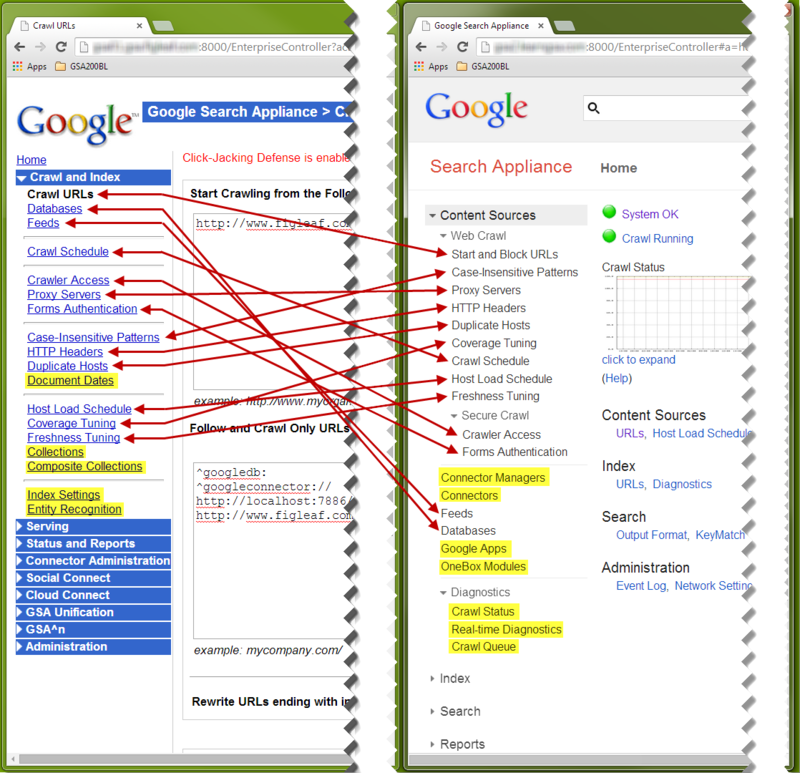 Serving covers any setting that controls search interactions. Status and Reports contains Crawl Status, the list of everything in the index (Crawl Diagnostics), all logs, and anything that can generate reports or other output for you to examine. 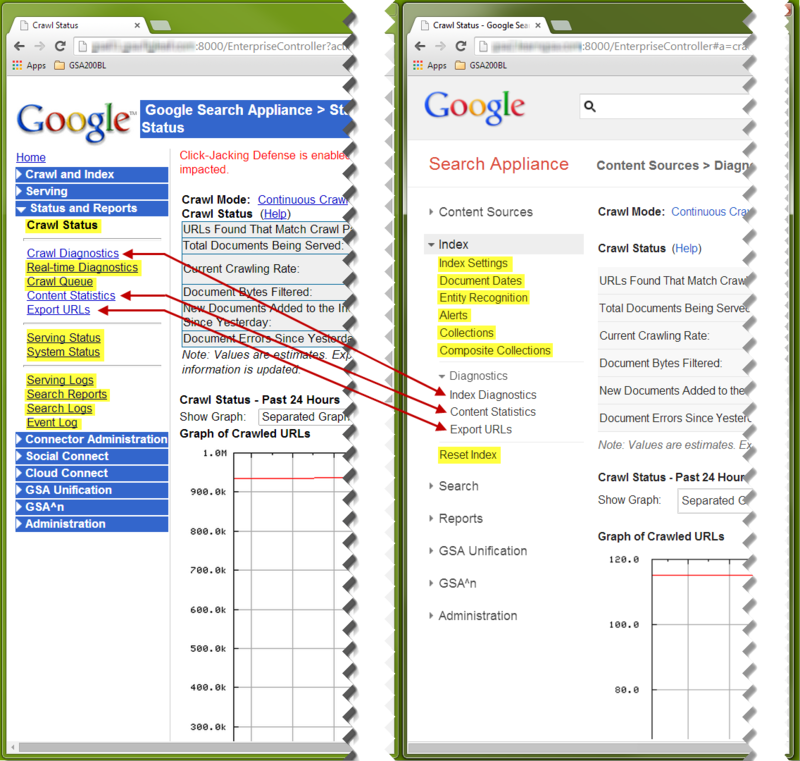 On GSA 7.2, we now have Content Sources, Index, Search and Reports. Content Sources only covers the acquisition of content. Index only covers the storage of that content. 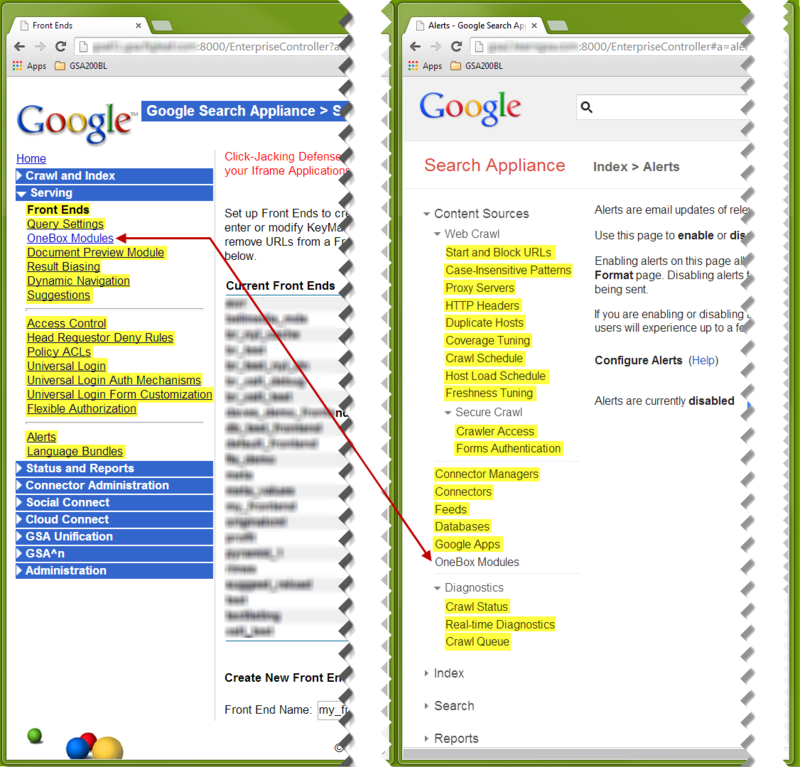 Search covers any setting that controls search interactions at serve time - this is slightly different from Serving on GSA 7.0, but most menu items that were under Serving are now under Search. Reports only has a few items now: Serving Logs, Search Reports and Search Logs. Most of the items previously under Status and Reports have been moved to Content Sources (Crawl Status, Crawl Queue, some of Real-time Diagnostics), Index (Content Statistics, Export URLs, and Index Diagnostics - formerly known as Crawl Diagnostics), Search (the rest of Real-time Diagnostics) and even Administration (Event Log). In the following series of screenshots, GSA 7.0 menu items are mapped to the corresponding GSA 7.2 menu items. The items that don't have a match within the currently displayed menus are highlighted in yellow. These items do have a match under another menu. The items that don't have a match at all in the other version are highlighted in green. 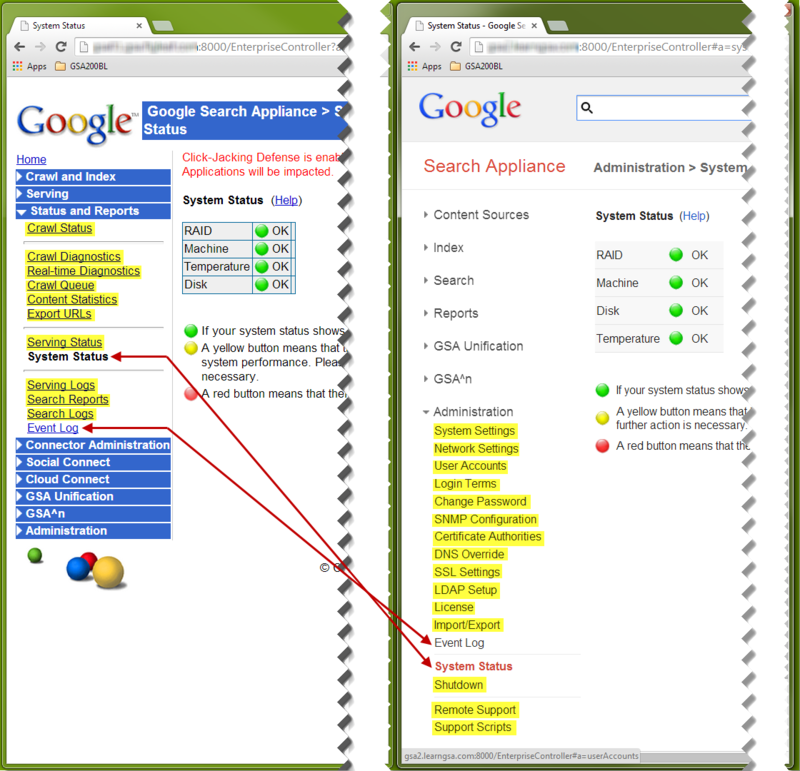 There's only one of these, and it's a new feature in GSA 7.2: Trusted Applications. 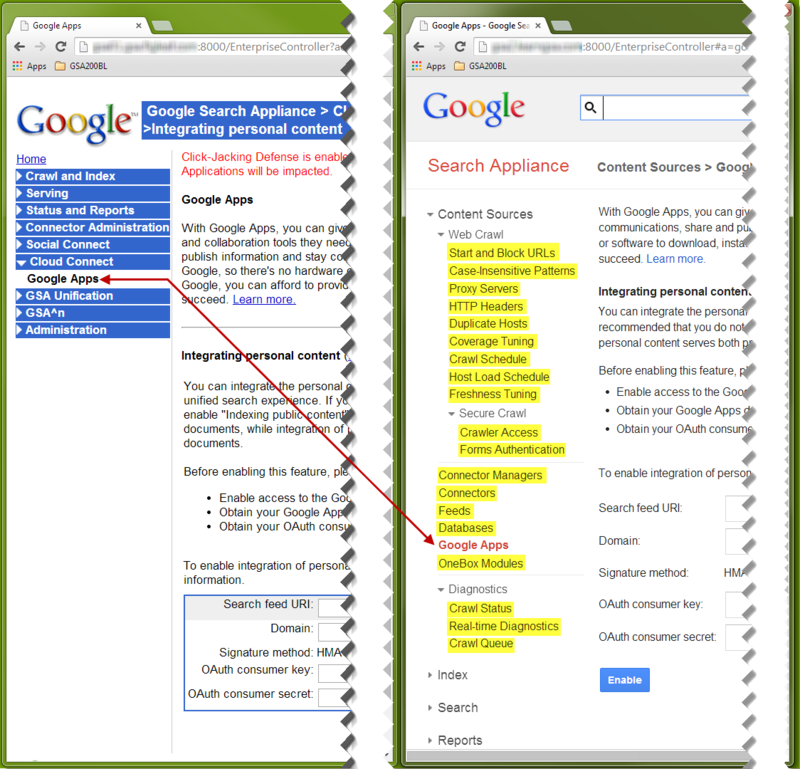 Many GSA 7.0 Crawl and Index menu items are found within Content Sources on GSA 7.2. The remaining GSA 7.0 Crawl and Index menu items can all be found under the Index menu on GSA 7.2. 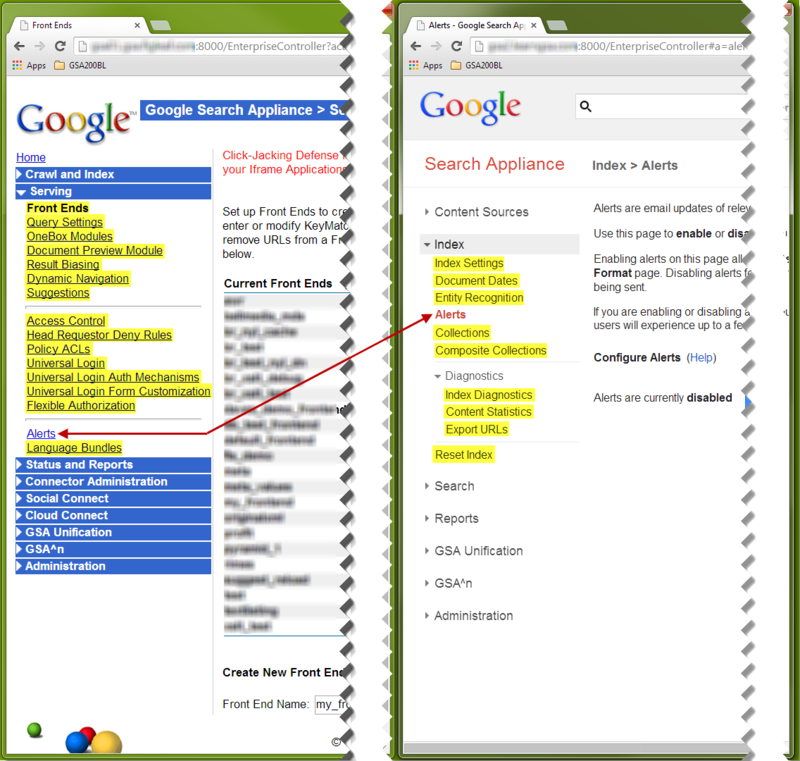 All of the GSA 7.0 Serving menu items are found in GSA 7.2 Search except for Alerts and OneBox Modules. Trusted Applications in 7.2, highlighted in green below, is a new feature. OneBox Modules are now found under Content Sources in 7.2. Alerts are now found under Index in 7.2. The menu items in GSA 7.0 Status and Reports, as described above, have been distributed to several menus in 7.2. Crawl Status, some parts of Real-time Diagnostics, and Crawl Queue are now under Content Sources. Crawl Diagnostics, Content Statistics and Export URLs are now under Index in 7.2. Crawl Diagnostics is now known as Index Diagnostics. 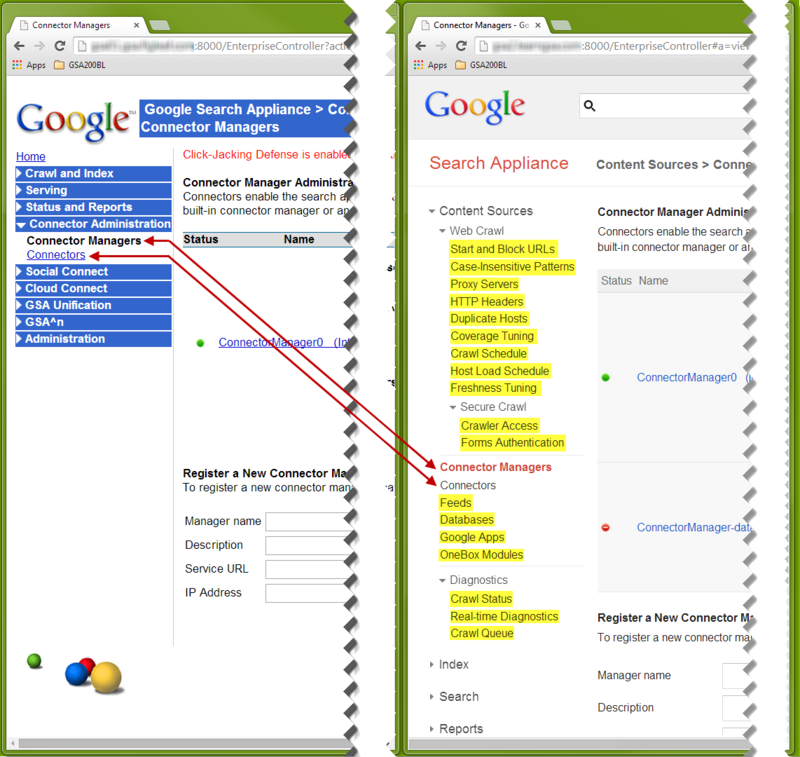 Search Status and the remainder of Real-time Diagnostics are now under Search in GSA 7.2. System Status and Event Log are now under Administration in GSA 7.2. 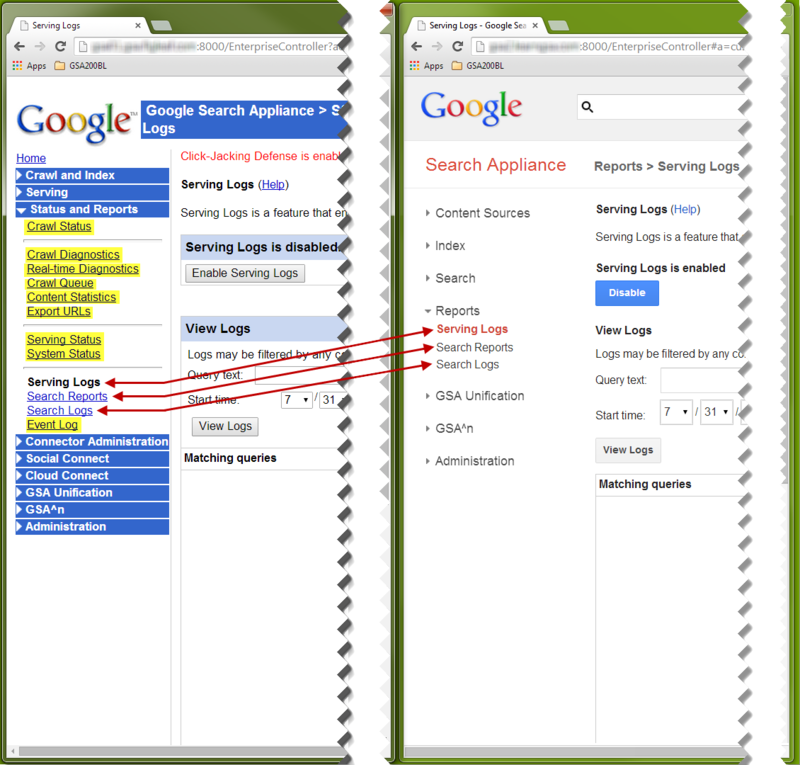 Serving Logs, Search Reports and Search Logs are under Reports in GSA 7.2. Connector Managers and Connectors no longer have their own menu. In GSA 7.2, they're under Content Sources. Likewise, the Social Connect menu in GSA 7.0 is gone. 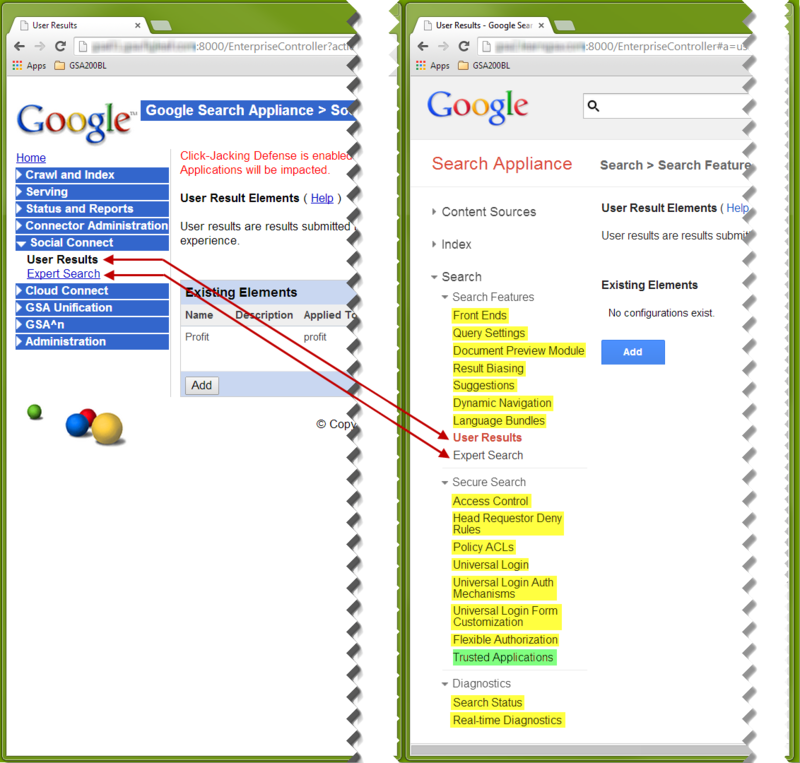 User Results and Expert Search are now both under Search in GSA 7.2. 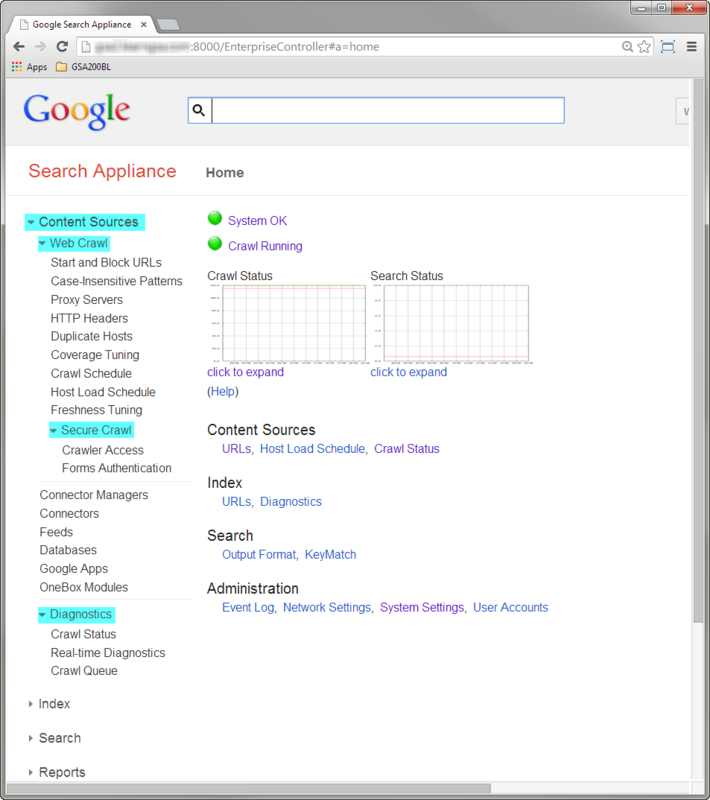 The Cloud Connect menu in GSA 7.0 has also been removed, and the single entry for Google Apps has been moved to Content Sources in GSA 7.2. 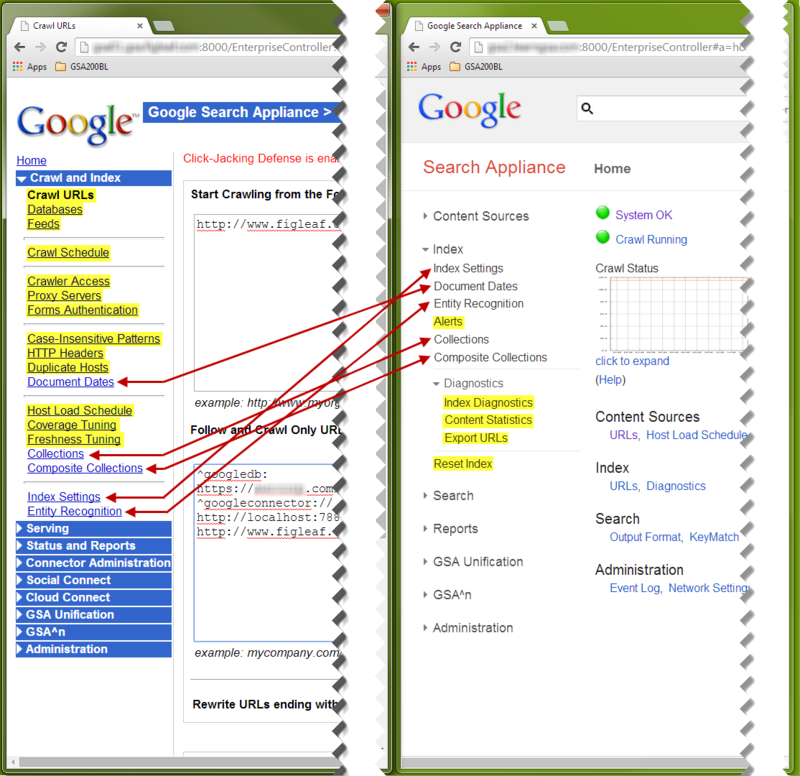 The GSA Unification and GSA^n menus haven't changed significantly across versions, although the design of some of the menu screens has changed a little bit. Still, everything's in the same place for these menus. The Reset Index menu under Administration in GSA 7.0 is now under Index in GSA 7.2. The menus in GSA 7.2 behave a little differently. 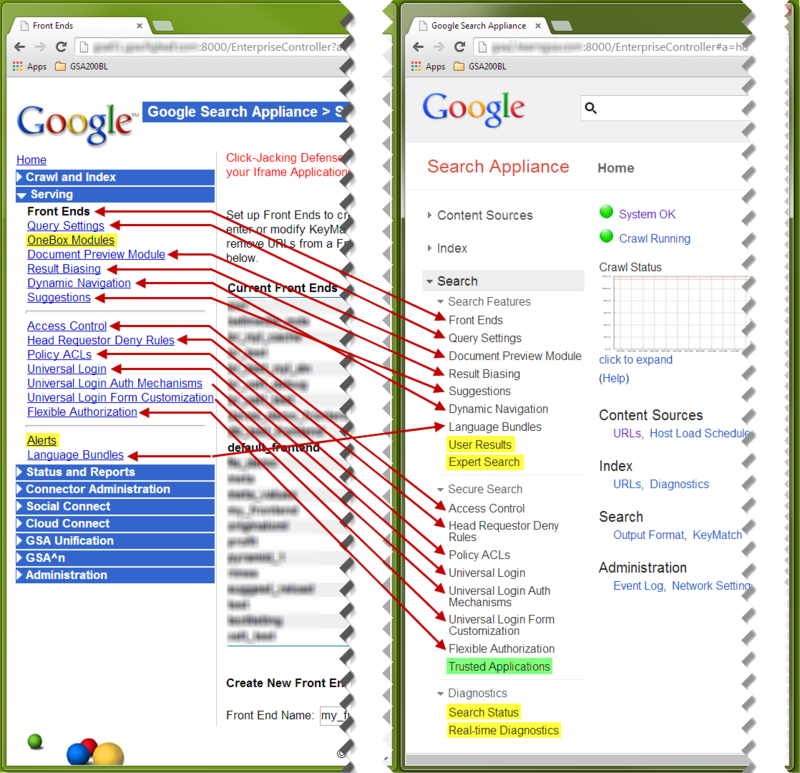 They're stored on the client, so they can be displayed as you click on them without a server-side page refresh. Clicking on a menu to expand it doesn't select the first menu item as it did in GSA 7.0, either. For example, in GSA 7.0, when you clicked on Crawl and Index, it would immediately show you the Start URLs page. In GSA 7.2, clicking on Content Sources just expands the menu, and you have to explicitly click on Start and Block URLs to view that. If you haven't actually clicked on a menu item in a while, your session may have expired. You can continue clicking on menus after your session has expired, but once you click on a menu item you'll be prompted to log in. Another minor difference is that some menus have nested menus. 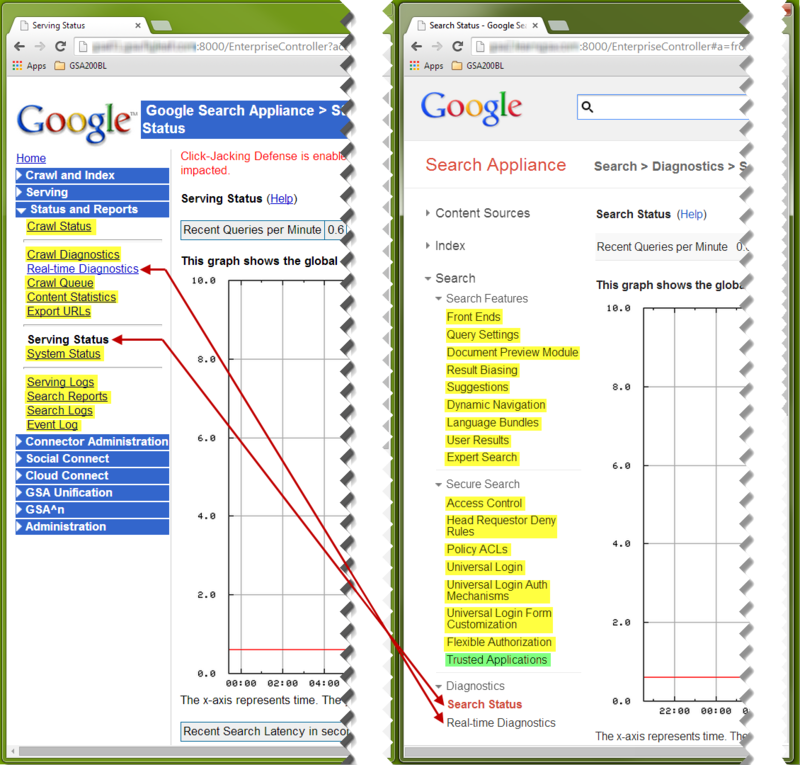 For example, in the screenshot below, Content Sources and its submenus are highlighted in blue. Clicking on these submenus simply expands or collapses them, and it's pretty easy to inadvertently collapse one of these by accident. The Start URLs page on GSA 7.0 was pretty simple: three HTML textareas for you to fill in. By default, in GSA 7.2 the Start and Block URLs page is quite a bit more complicated, in an attempt to make it easier to use. Each line item in each of the three sections (Start URLs, Follow Patterns, Do Not Follow Patterns) is a separate entry, and clicking on it opens a textarea containing just that item. Each line also has an Actions button and a Trash button. 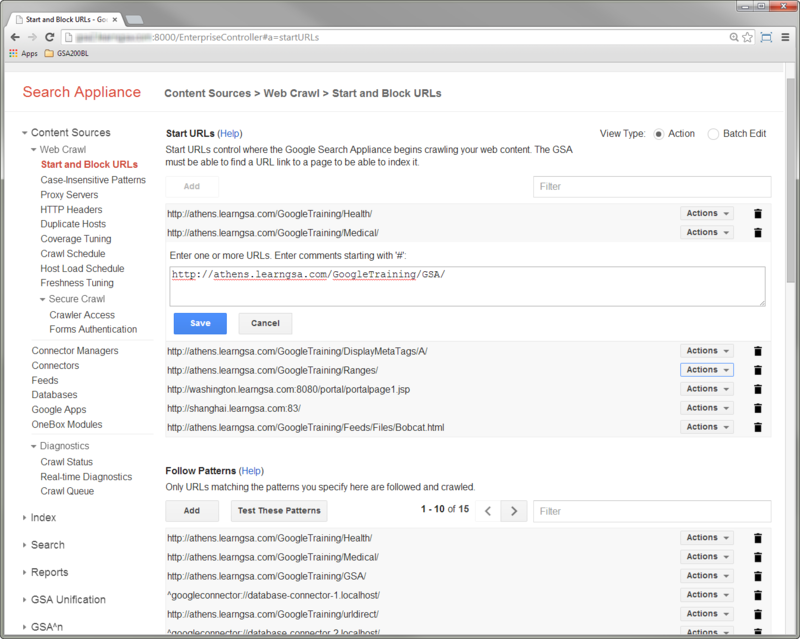 The Actions button lets you use that URL directly in Crawler Access, Index Diagnostics or a recrawl request! 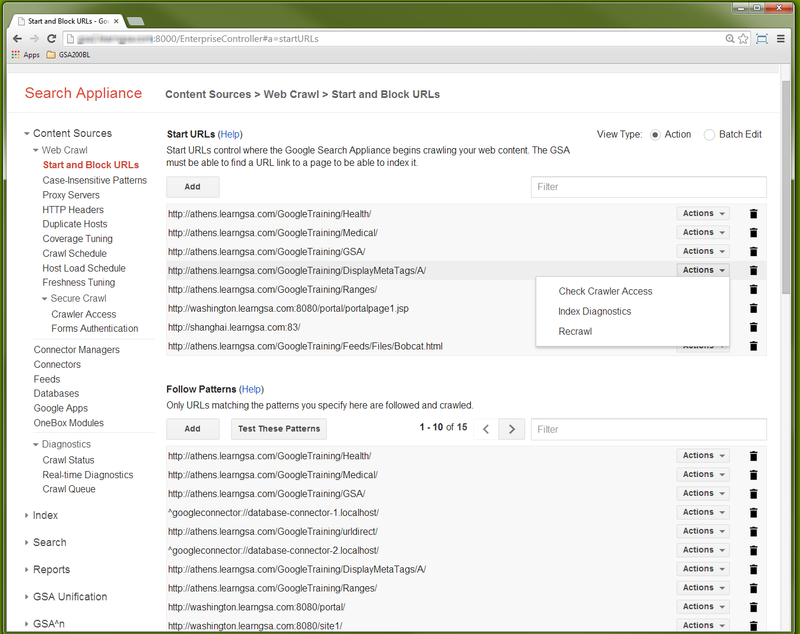 However, you might find it's a lot harder to just type or edit URLs and patterns in this interface. In that case, click the Batch Edit radio button at the top right and you get the 7.0-style interface back. You can switch back and forth any time. While the two admin consoles are pretty similar, enough things have been moved around and changed that you might get confused! This quick tour is intended to prevent that confusion, but if you have any questions, please feel free to send them to google@figleaf.com and we'll be happy to respond!